HARARE - In the latest standoff between the government and striking junior doctors, senior medical personnel have now joined the industrial action by their juniors - leading to the suspension of major procedures at public health institutions across the country. This follows the government's ill-advised recent decision to suspend 530 junior doctors over their industrial action which was declared illegal by the Labour Court. In a statement over the Christmas holiday, the Zimbabwe Hospital Doctors Association (ZHDA) said middle level and senior doctors had now also embarked on an industrial action with immediate effect. "Negotiations for doctors and other health workers' welfare take place in the Health Service Bipartite Negotiating Panel (HSBNP), guided by Statutory Instrument III of 2006. "The employer has not taken this forum seriously and since 1 December, only three fruitless meetings have been held. "To further show their lack of seriousness, the employer has failed to address issues, but instead taken the association to court and ordered members to resume work disgruntled," ZHDA said. "Our membership has stated firmly that they will not risk the lives of patients by working under duress ... and will not return to work in potentially hazardous spaces. "More so, the doctors did not receive their December salaries and are incapacitated to go to work. The response by the employer has been to suspend most of our members, pending hearings. "This brutal, hard stance will not bring any fruit towards resolving the impasse, but instead is regressive," ZHDA secretary-general Mthabisi Bhebhe said. "Following this move, middle level and senior doctors in nine provinces have withdrawn their services and will only resume work when these members are reinstated and meaningful negotiations are underway. "The Health Service Board is playing politics with the lives of our fellow countrymen, throwing a legal charade whilst failing to address the issues affecting our health sector. "It is our view that the ministry and the Health Service Board have failed their mandate, and we hereby call for the dissolution of the Health Service Board and the setting up of an independent Health Service Commission," Bhebhe added. "We will only return to work when the government treats our health sector with the delicacy and professionalism it deserves," he said further. 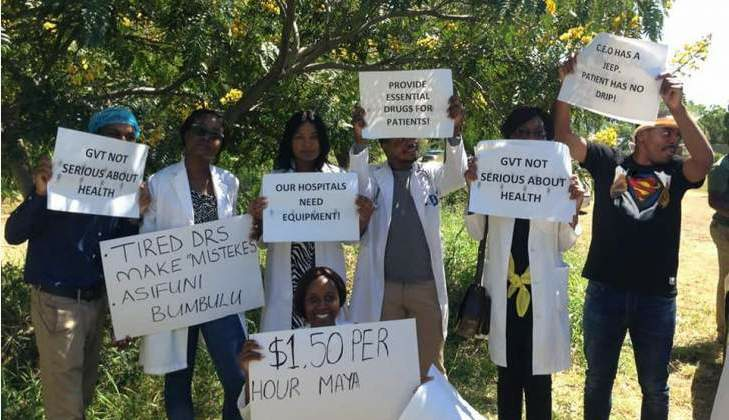 Junior doctors have been on strike for more than five weeks, protesting the severe shortages of pharmaceutical drugs at public hospitals, as well as the selling of available drugs in foreign currency by retail pharmacies among a host of other grievances. The government this week responded to their strike by suspending without pay 530 doctors — following a recent ruling by the Labour Court which declared the industrial action illegal. Bhebhe accused Health and Child Care minister Obadiah Moyo of "misleading" the nation on the state of the drugs situation at public hospitals. Moyo, who was not picking up his calls yesterday when the Daily News tried to reach him, has claimed that the government now has stocks of drugs and other essentials used in the health delivery system. "The said drugs which have been supposedly stocked at Natpharm have not reached any of our government institutions. "If indeed the drugs and protective clothing are there, our members have made it clear that these should be seen at hospitals. "This comes against a background of several promises of medicines and equipment made by the ministry since January this year, with none being fulfilled. "In addition, the stated stocks will not last our institutions long and we have requested the ministry to set targets and provide time lines as to when the target stocks will be reached, but to no avail," Bhebhe said. He also accused the government of negotiating in "bad faith" on the issue of their salaries. "According to the collective bargaining agreement 2 (CBA2) of March 2018, our salaries and allowances are pegged in United States dollars (USD). "The employer has been countlessly breaching this CBA, firstly by applying it electively across the health workers ... secondly by implementing it unfairly … and unilaterally slashing on-call allowances of middle level and senior doctors. "The ministry did not heed our call to rectify these but has gone on to unilaterally decide to pay us in RTGS. This is a clear violation of the CBA and all we ask is the employer to honour the legally binding contract and pay us in US dollars," Bhebhe said further.